Interestingly this is usually said to me by Muslims, who feel open enough to point it out, as opposed to others who’d rather prefer Islamophobia doesn’t exist. I appreciate the sentiment, and the instinctive side of me wants to automatically nod in agreement – I mean, what is so wrong about that sentence?… It’s true, is it not? I’m apparently confident in my skin, engaged with my community, and blessed to be employed in a great environment… DESPITE my many colourful hijabs. So why does it instead strike me the wrong way? Why does this seemingly innocent observation irritate me deeply? 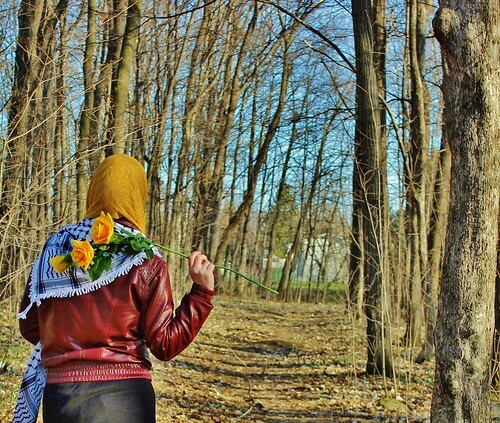 Wearing the hijab is a constant visible reminder to myself that no one has any claim to me, my mind, or my body. Sometimes as a human being, I get insecure and wonder what others are thinking about me. But then I look at my reflection when I am out in public, and where others just see a piece of cloth, I see a reminder to myself. I am powerfully reminded that no matter how many things I might feel attached to, the only real lasting thing my heart can know is Allah. I am God’s and God’s alone, and this is liberating. “Yet she belongs, finally and truly, only to God. The hijab is a symbol of freedom from the male regard, but also, in our time, of freedom from subjugation by the iron fist of materialism, deterministic science, and the death of meaning” (Abdal-Hakim Murad, Commentary on the Eleventh Contentions, 29). Just as hijab hides certain physical aspects of a woman’s body, like her hair, curves and skin, it is a metaphor for me to guard my heart away from the harm that others can inflict on it. I protect my heart by being meditative, listening and speaking with it, and discovering who I really am without waiting for a messed up world to tell me who I am supposed to be. Hijab is not the sole means, but a helpful ingredient certainly, to reminding me that my heart is precious and full of a deep beauty that does not need to be given freely to just anyone who wants access to it. Hijab is my personal physical reminder that within lies a spiritual reality that wants to be realized, and that I have a right to this inner life. “Hijab indicates freedom from the monoculture, but also freedom from the visual theft of her beauty. It is a denial of the Other’s right of appropriation. (Commentary on the Eleventh Contentions, 95)”. Hijabs means various things to different people, and each woman will have her own story to say. Let’s never make the mistake of assuming that all Muslims think, act and are motivated by the same motives. In my case, hijab has made me more my own by connecting me more closer to God. It has made me more confident to be unapologetically me. It has made me want to excel in all that I do, whether in relationships, faith matters or career goals. All this not despite my hijab, but because of it.